Joomla 3.7, which is about to be releases early 2017 contains a new feature called Multilingual Associations, allowing for easy side-by-side translations. 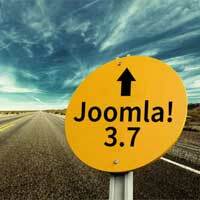 This will make Joomla 3.7 the best update in years, together with the addition of Custom Fields for our articles and the new Router for improved URL’s (allowing you to remove the numbers in your Joomla article’s URL’s). Before 3.7 you had to manually attach the articles for each language to the corresponding translated article, which could be a bit tedious. Now however, this is greatly automated. Let me show you how it works. First, make sure to install a 3.7 site (or the currently available Alpha release). If you follow the instructions to install a second or third language, the translations will already be set-up, including 2 dummy articles for you to get standard: one in English and one in Dutch as in my example. This is all still standard. But now go to the new core component called Multilingual Associations (under the Components menu-item). Initially this is a screen without any records. You see: 2 translation screens, sitting nicely side-by-side, now isn’t that nice! 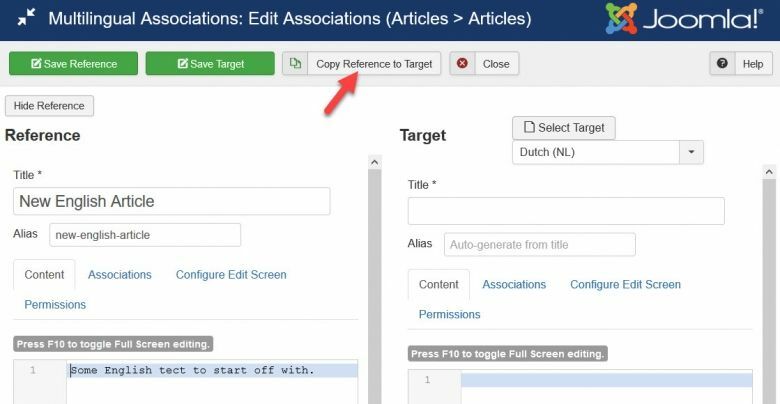 And the best part is: there is this subtle button there, called Copy Reference to Target, which allows you to copy all content (including metatags and images) to the new translated article. This allows you to start off with this text and adapt as needed. For images, adaptation is often not needed and this makes the copy-feature very handy! You may have used this kind of feature before in Joomla translation extensions like Falang, Joomfish or Neno and now you can simply do so in Joomla. Once ready, you should save your changes. Note that there now are 2 buttons to save things. For new translations you will click the Save Target button, but often you may notice typo’s or errors in the original English article as well. Within the same screen, you can save those to. To save these, you will have to click the Save Reference button. Clicking on the Create button simply creates a new article right away in your second language. It opens in a modal pop-up and after creating it, you can immediately set it as the associated article. You see there are 2 ways to build your translations now. It depends on your preferences which workflow you prefer. What about 3rd-party Multilanguage extensions now? This will for sure have an impact on existing translation plugins and extensions. In many cases, you may not need them anymore, since managing them in the core has been made so easy. It could however still be that your component does not yet support the new feature or that the current features are still not good enough. For those cases, you may still need extensions like Falang or especially Neno, which is an extremely strong translation solution. So, have fun with Joomla 3.7. I’m sure you will like it!